For other uses, see Jack-o'-lantern (disambiguation). A jack-o'-lantern in the shape of the Wikipedia logo. A traditional jack-o'-lantern, made from a pumpkin, lit from within by a candle. In a jack-o'-lantern, the top of the pumpkin or turnip is cut off to form a lid, the inside flesh is scooped out, and an image — usually a scary or funny face – is carved out of the rind to expose the hollow interior. To create the lantern effect, a light source, traditionally a flame such as a candle or tea light, is placed within before the lid is closed. However, artificial jack-'o-lanterns with electric lights are also marketed. 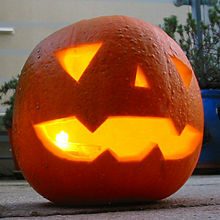 It is common to see jack-o'-lanterns on doorsteps and otherwise used as decorations prior to and on Halloween. An assortment of carved pumpkins. The term jack-o'-lantern was originally used to describe the visual phenomenon ignis fatuus (lit., "foolish fire") known as a will-o'-the-wisp in English folklore. Used especially in East England, its earliest known use dates to the 1660s. The term "will-o'-the-wisp" uses "wisp" (a bundle of sticks or paper sometimes used as a torch) and the proper name "Will": thus, "Will-of-the-torch." The term jack o'lantern is of the same construction: "Jack of [the] lantern." A traditional Irish Jack-o'-Lantern in the Museum of Country Life, Ireland. Modern carving of a Cornish Jack-o'-Lantern made from a turnip. The carving of vegetables has been a common practice in many parts of the world, and gourds were one of the earliest plant species farmed by humans c. 10,000 years ago. For example, gourds were used to carve lanterns by the Māori over 700 years ago; the Māori word for a gourd also describes a lampshade. It is believed that the custom of making jack-o'-lanterns at Halloween time began in Ireland. 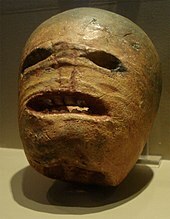 In the 19th century, "turnips or mangel wurzels, hollowed out to act as lanterns and often carved with grotesque faces," were used on Halloween in parts of Ireland and the Scottish Highlands. In these Gaelic-speaking regions, Halloween was also the festival of Samhain and was seen as a time when supernatural beings (the Aos Sí), and the souls of the dead, walked the earth. 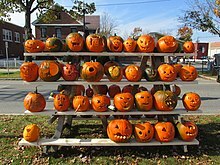 Jack-o'-lanterns were also made at Halloween time in Somerset (see Punkie Night) during the 19th century. By those who made them, the lanterns were said to represent either spirits or supernatural beings, or were used to ward off evil spirits. For example, sometimes they were used by Halloween participants to frighten people, and sometimes they were set on windowsills to keep harmful spirits out of one's home. It has also been suggested that the jack-o'-lanterns originally represented Christian souls in purgatory, as Halloween is the eve of All Saints' Day (1 November)/All Souls' Day (2 November). On Halloween in 1835, the Dublin Penny Journal wrote a long story on the legend of "Jack-o'-the-Lantern". In 1837, the Limerick Chronicle refers to a local pub holding a carved gourd competition and presenting a prize to "the best crown of Jack McLantern". The term "McLantern" also appears in an 1841 publication of the same paper. In my juvenile days I remember to have seen peasant boys make, what they called a "Hoberdy's Lantern," by hollowing out a turnip, and cutting eyes, nose, and mouth therein, in the true moon-like style; and having lighted it up by inserting the stump of a candle, they used to place it upon a hedge to frighten unwary travellers in the night. The old time custom of keeping up Hallowe'en was not forgotten last night by the youngsters of the city. They had their maskings and their merry-makings, and perambulated the streets after dark in a way which was no doubt amusing to themselves. There was a great sacrifice of pumpkins from which to make transparent heads and face, lighted up by the unfailing two inches of tallow candle. James Fenimore Cooper wrote a nautical novel titled The Jack O'lantern (le Feu-Follet), Or the Privateer (1842). The Jack O'lantern was the name of the ship. It is an ancient British custom to light great bonfires (Bone-fire to clear before Winter froze the ground) on Hallowe'en, and carry blazing fagots about on long poles; but in place of this, American boys delight in the funny grinning jack-o'-lanterns made of huge yellow pumpkins with a candle inside. In the United States, the carved pumpkin was first associated with the harvest season in general, long before it became a symbol of Halloween. In 1895, an article on Thanksgiving entertaining recommended a lit jack-o'-lantern as part of the festivities. Pumpkin projected onto the wall. The story of the jack-o'-lantern comes in many forms and is similar to the story of Will-o'-the-wisp retold in different forms across Western Europe, including, Italy, Norway, Spain and Sweden. In Switzerland, children will leave bowls of milk or cream out for mythical house spirits called Jack o' the bowl. An old Irish folk tale from the mid-18th century tells of Stingy Jack, a lazy yet shrewd blacksmith who uses a cross to trap Satan. One story says that Jack tricked Satan into climbing an apple tree, and once he was up there, Jack quickly placed crosses around the trunk or carved a cross into the bark, so that Satan couldn't get down. Another version of the story says that Jack was getting chased by some villagers from whom he had stolen. He then met Satan, who claimed it was time for him to die. However, the thief stalled his death by tempting Satan with a chance to bedevil the church-going villagers chasing him. Jack told Satan to turn into a coin with which he would pay for the stolen goods (Satan could take on any shape he wanted); later, when the coin (Satan) disappeared, the Christian villagers would fight over who had stolen it. The Devil agreed to this plan. He turned himself into a silver coin and jumped into Jack's wallet, only to find himself next to a cross Jack had also picked up in the village. Jack had closed the wallet tight, and the cross stripped the Devil of his powers; and so he was trapped. In both folktales, Jack lets Satan go only after he agrees to never take his soul. Many years later, the thief died, as all living things do. Of course, Jack's life had been too sinful for him to go to heaven; however, Satan had promised not to take his soul, and so he was barred from hell as well. Jack now had nowhere to go. He asked how he would see where to go, as he had no light, and Satan mockingly tossed him a burning coal, to light his way. Jack carved out one of his turnips (which were his favorite food), put the coal inside it, and began endlessly wandering the Earth for a resting place. He became known as "Jack of the Lantern", or jack o'lantern. Jack-o-lanterns were also a way of protecting one's home against the undead. Superstitious people used them specifically to ward off vampires. They thought this because it was said that the jack-o-lantern's light was a way of identifying vampires who, once their identity was known, would give up their hunt for you. Sections of the pumpkin or turnip are cut out to make holes, often depicting a face, which may be either cheerful, scary, or comical. Complex carvings (or paintings on the gourds) are becoming more common such as: figures, logos, and symbols. A variety of tools can be used to carve and hollow out the gourd, ranging from simple knives and spoons to specialized instruments, typically sold in holiday sections of North American grocery stores. Printed stencils can be used as a guide for increasingly complex designs. After carving, a light source (such as a flame candle, electric candle, or tea light) is placed inside the gourd, and the top is put back into place. The source is normally inserted to light the design from the inside and add an extra measure of spookiness. Sometimes a chimney is carved, too. It is possible to create surprisingly artistic designs, either simple or intricate in nature. For a long time, Keene, New Hampshire, held the world record for most jack-o'-lanterns carved and lit in one place. The Life is Good company teamed up with Camp Sunshine, a camp for children with life-threatening illnesses and their families, to break the record. A record was set on October 21, 2006, when 30,128 jack-o'-lanterns were simultaneously lit on Boston Common. Highwood, Illinois, tried to set the record on October 31, 2011, with an unofficial count of 30,919 but did not follow the Guinness regulations, so the achievement did not count. On October 19, 2013, Keene, New Hampshire, broke the Boston record and reclaimed the world record for most lit jack-o'-lanterns on display (30,581). Keene has now broken the record eight times since the original attempt. ^ "History of the Jack O' Lantern". HISTORY. Retrieved 2018-10-25. ^ Harper, Douglas. "Jack o'lantern (n.)". Online Etymology Dictionary. Retrieved 9 May 2013. ^ Paris, H.S. (1989). "Historical records, origins, and development of the edible cultivar groups of Cucurbita pepo (Cucurbitaceae)". Economic Botany. 43 (4): 423–443. doi:10.1007/bf02935916. ^ "Te Ao Hou". The Maori Magazine. National Library of New Zealand. June 1962. Retrieved October 16, 2013. ^ Buse, Jasper; Raututi Taringa (1995). Cook Islands Maori Dictionary. p. 537. ^ The Oxford Companion to American Food and Drink. Oxford University Press. 2007. p. 269. Retrieved February 17, 2011. ^ "Pumpkins Passions". BBC. October 31, 2005. Retrieved October 19, 2006. They continue to be popular choices today as carved lanterns in Northern England, Scotland, and Northern Ireland; the British purchased a million pumpkins for Halloween in 2004." ^ "Turnip battles with pumpkin for Hallowe'en". BBC. October 28, 2005. Retrieved September 23, 2007. ^ a b c Hutton, Ronald (1996). The Stations of the Sun: A History of the Ritual Year in Britain. Oxford University Press. pp. 382–383. ^ a b Palmer, Kingsley (1973). Oral folk-tales of Wessex. David & Charles. pp. 87–88. ^ a b Arnold, Bettina (2001-10-31). "Bettina Arnold – Halloween Lecture: Halloween Customs in the Celtic World". Halloween Inaugural Celebration. University of Wisconsin–Milwaukee: Center for Celtic Studies. Archived from the original on 2011-06-24. Retrieved 2007-10-16. ^ Wilson, David Scofield (1999). Rooted in America: Foodlore of Popular Fruits and Vegetables. University of Tennessee Press. p. 154. ^ Rogers, Nicholas (2003). Halloween: From Pagan Ritual to Party Night. Oxford University Press. p. 57. ^ "History of Jack-o'-the-Lantern". Dublin Penny Journal. 3–4: 229, 1835. ^ Allies, Jabez (1856). The British, Roman, and Saxon antiquities and folklore of Worcestershire. London: J.R. Smith. p. 423. ^ "Jack-o'-lantern". Oxford English Dictionary. The earliest citation is from 1663. ^ "Carved pumpkin". Daily News. Kingston, Ontario. November 1, 1866. ^ "Review of Cooper's 'Jack O'Lantern'". The Spectator. December 3, 1842. ^ Whittier, John Greenleaf (1885). "The Pumpkin". Poets.org. Archived from the original on 2010-11-28. ^ Sage, Agnes Carr (October 27, 1885). "Halloween Sports and Customs". Harper's Young People. p. 828. ^ a b "The Day We Celebrate: Thanksgiving Treated Gastronomically and Socially". The New York Times. November 24, 1895. p. 27. ^ "Odd Ornaments for Table". The New York Times. October 21, 1900. p. 12. ^ Santino, Jack (1995). All Around the Year: Holidays and Celebrations in American Life. University of Illinois Press. p. 157. ^ Allies, Jabez (1856). The British, Roman, and Saxon antiquities and folklore of Worcestershire. London: J.R. Smith. p. 430. ^ Newell, William Wells (1 January 1904). "The Ignis Fatuus, Its Character and Legendary Origin". Journal of American Folk-Lore. 17. ^ "History of the Jack O' Lantern". HISTORY. Retrieved 2018-10-20. ^ Simpson, Jacqueline; Roud, Steve (2000). A Dictionary of English Folklore. Oxford University Press. ^ James, David (2016-10-31). "The Tale o' Jack-o'-Lantern". 5-Minute History. Retrieved 2018-12-11. ^ Poe, R.H.; Hart, R.M. ; Foster, K.; Noyes, L. (1990). You Can Carve Fantastic Jack-O-Lanterns. Storey Communications. ISBN 978-0-88266-580-1. ^ "Most Lit Jack-o'-lanterns Displayed". Guinness World Records. 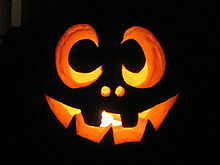 Look up jack-o'-lantern in Wiktionary, the free dictionary. This page was last edited on 19 April 2019, at 13:45 (UTC).